Space Shuttle Atlantis begins the last mission of the Space Shuttle program. Space Shuttle Atlantis touches down for the final time, July 21, 2011, at the end of STS-135. The Shuttle was presented to the public in 1972 as a "space truck" which would, among other things, be used to build a United States space station in low earth orbit in the early 1990s and then be replaced by a new vehicle. When the concept of the U.S. space station evolved into that of the International Space Station, which suffered from long delays and design changes before it could be completed, the service life of the Space Shuttle was extended several times until 2011 when it was finally retired. 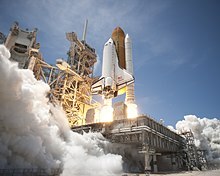 In 2010 the Shuttle was formally scheduled for retirement with Atlantis being taken out of service first after STS-132 in May of that year, but the program was once again extended when the two final planned missions were delayed until 2011. Later, one additional mission was added for Atlantis for July 2011, extending the program further. Counter-proposals to the shuttle's retirement were considered by Congress and the prime contractor United Space Alliance as late as spring 2010. Hardware developed for the Space Shuttle met various ends with conclusion of the program, including donation, disuse and/or disposal, or reuse. An example of reuse, is that one of the three Multi-Purpose Logistics Module (MPLM) was converted to a permanent module for the International Space Station. * Prior to its move to New York, Enterprise was displayed at the Udvar-Hazy Center, Smithsonian Institution's National Air and Space Museum, Chantilly, Virginia, where Discovery has taken its place. Museums and other facilities not selected to receive an orbiter were disappointed. Elected officials representing Houston, Texas, location of the Johnson Space Center; and Dayton, Ohio, location of National Museum of the United States Air Force called for Congressional investigations into the selection process, though no such action was taken. While local and Congressional politicians in Texas questioned if partisan politics played a role in the selection, former JSC Director Wayne Hale wrote "Houston didn't get an orbiter because Houston didn't deserve it" pointing to weak support from area politicians, media and residents, describing a "sense of entitlement". Chicago media questioned the decision not to include the Adler Planetarium in the list of facilities receiving orbiters, pointing to Chicago's 3rd-largest population in the United States. The chair of the NASA committee that made the selections pointed to the guidance from Congress that the orbiters go to facilities where the most people could see them, and the ties to the space program of Southern California (home to Edwards Air Force Base, where nearly half of shuttle flights have ended and home to the plants which manufactured the orbiters and the Space Shuttle Main Engines), the Smithsonian (curator of the nation's air and space artifacts), the Kennedy Space Center Visitor Complex (where all Shuttle launches originated, and a large tourist draw) and the Intrepid Sea, Air, & Space Museum (Intrepid also served as the recovery ship for Project Mercury and Project Gemini). In August 2011 the NASA Inspector General released an audit of the display selection process; it highlighted issues which led to the final decision. The Museum of Flight in Seattle, Washington, March Field Air Museum, Riverside, California, Evergreen Aviation and Space Museum, McMinnville, Oregon, National Museum of the U.S. Air Force, Dayton, Ohio, San Diego Air and Space Museum, San Diego, Space Center Houston, Houston, Texas, Tulsa Air and Space Museum & Planetarium, Tulsa, Oklahoma and U.S. Space and Rocket Center, Huntsville, Alabama scored poorly on international access. Additionally Brazos Valley Museum of Natural History and the Bush Library at Texas A&M, in College Station, Texas scored poorly on museum attendance, regional population and was the only facility found to pose a significant risk in transporting an orbiter there. Overall, the California Science Center scored first and Brazos Valley Museum of Natural History scored last. The two most controversial locations which were not awarded an orbiter, Space Center Houston and National Museum of the U.S. Air Force, finished 2nd to last and near the middle of the list respectively. The report noted a scoring error, which if corrected would have placed the National Museum of the U.S. Air Force in a tie with the Intrepid Museum and Kennedy Visitor Complex (just below the California Science Center), although due to funding concerns the same decisions would have been made. The Museum of Flight in Seattle, Washington was not selected to receive an orbiter but instead received the three–story Full Fuselage Trainer from the Space Vehicle Mockup Facility at Johnson Space Center in Houston, Texas. Museum officials, though disappointed, were able to allow the public to go inside the trainer, something not possible with an actual orbiter. In addition to the challenge of transporting the large vehicles to the display site, placing the units on permanent display required considerable effort and cost. An article in the February 2012 issue of Smithsonian magazine discussed the work performed on Discovery. It involved removing the three main engines (they were slated to be reused on NASA's new Space Launch System); the windows were given to project engineers for analysis of how materials and systems fared after repeated space exposure; the communications modules were removed due to national–security concerns; and hazardous materials such as traces of propellants were thoroughly flushed from the plumbing. The total cost of preparation and delivery via a modified Boeing 747 was estimated at $26.5 million in 2011 dollars. Spacelab Pallet Elvis – handed over to the Swiss Museum of Transport, Switzerland, in March 2010. One of the two Spacelabs—on display at Bremen Airport, Germany. MPLM Donatello: the unused MPLM, some parts were cannibalized for Leonardo. The remainder is mothballed in the ISS processing facility at Kennedy Space Center. NASA ran a program to donate thermal protection system tiles to schools and universities for US$23.40 each (the fee for S&H). About 7000 tiles were available on a first-come, first-served basis, but limited to one per institution. Each orbiter incorporated over 24,000 tiles. 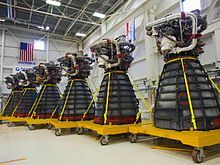 About 42 reusable Space Shuttle Main Engines (Pratt & Whitney RS-25/26) have been part of the STS program, with three used per orbiter per mission. The decision was made to retain all engines with plans to make use of them in future launch vehicles. Worn out engine nozzles are typically considered scrap, although nine nozzles were refurbished for display on the donated orbiters, so the actual engines can be retained by NASA. Three Shuttle arms were used by NASA; the arms of both Discovery and Atlantis will be left in place for their museum display. Endeavour's arm is to be removed from the orbiter for separate display in Canada. The OBSS extension of Endeavour's arm was left on the International Space Station, for use with the station's robotic arm. In December 2010, as NASA prepared for the STS program ending, an audit by the NASA Office of Inspector General (OIG) found that information technology had been sold or prepared for sale that still contained sensitive information. NASA OIG recommended NASA be more careful in the future. The twin pads originally built for the Apollo program are now inactive. LC-39B was deactivated first on January 1, 2007. Three lightning towers were added to the pad and it was temporarily "re-activated" in April 2009 when Endeavour was placed on standby to rescue the STS-125 crew (the STS-125 mission was the last to visit the Hubble Space Telescope, which meant that the ISS was out of range) if needed; Endeavour was then moved over to LC-39A for STS-126. In October 2009 the prototype Ares I-X rocket was launched from 39B. The pad was then permanently deactivated and has since been dismantled and is being modified for the Space Launch System program, and possibly other launch vehicles. Like the Apollo structures before them, the shuttle structures were scrapped. 39A was deactivated in July 2011 after STS-135 was launched. On January 16, 2013, it was erroneously reported[who?] that NASA planned to abandon the pad, but the actual plan is to, like pad B, convert it for other rockets without dismantling it. If NASA did plan to permanently decommission the pads, they would have to restore them to their original Apollo-era appearance, as both pads are on the National Historic Register. In December 2013 NASA announced that SpaceX would be the new tenant of pad 39A. SpaceX has since converted the pad to launch Falcon Heavy and manned Crew Dragon Falcon 9 flights. Following the destruction of Space Launch Complex 40 in an on-pad explosion in September 2016, SpaceX had to move all east coast launches to 39A while SLC-40 was being rebuilt. The first launch, Dragon resupply vehicle carried by a Falcon 9, occurred February 12, 2017. This flight was the first unmanned launch from Complex 39 since Skylab was launched in 1973. Once SLC-40 is back in action, SpaceX will finish modifying the pad for Falcon Heavy. Due to SLC-40s destruction, 39A had to be rushed into service, and activities such as dismantling the RSS were put on hold. After STS-135, the VAB was used as a storage shed for the decommissioned shuttles before they were sent to museums. High Bay 3 is now being gutted of all equipment and given upgraded platforms, to support the Space Launch System and potentially the SpaceX Falcon Heavy as well as other vehicles. After the shuttle was decommissioned, NASA opened the VAB for public tours, which ended on February 11, 2014 as NASA prepares the VAB for future launch vehicles. The twin launch platforms are currently being modified for the Space Launch System with a large tower resembling those used in the Apollo program. Work is expected to be complete by 2016. The Crawler-Transporters were used as the mobile part of the pad with the shuttles; the two vehicles were deactivated and are being upgraded for the SLS program. The crawlerways used for transporting launch vehicles from the VAB to the twin pads of KSC are also being extensively renovated for the SLS program. Used to mate the shuttle on the Shuttle Carrier Aircraft, the Mate-Demate Devices were dismantled and scrapped. Two modified Boeing 747s were used to fly the shuttles back to KSC when they landed at Edwards AFB. N911NA was retired on February 8, 2012 and is now a parts hulk for the Stratospheric Observatory for Infrared Astronomy. Beginning in September 2014, N911NA was loaned out to the Joe Davies Heritage Airpark, in Palmdale, CA, where it is on outdoor display next to a B-52. The other aircraft, N905NA was used to send Discovery, Endeavour and Enterprise to their museums and in September 2012 was found to have few parts for SOFIA. It is currently a museum piece at the Johnson Space Center. Used to retrieve the SRBs, MV Liberty Star and Freedom Star are now separated. Liberty Star was renamed as TV Kings Pointer and was transferred to the Merchant Marine Academy in New York for use as a training vessel. It will remain on call in case NASA needs it for further missions. Freedom Star was transferred to the James River Reserve Fleet on September 28, 2012 and placed under ownership of the United States Department of Transportation. The buildings used to process the shuttles after each mission were decommissioned. OPF-1 was leased to Boeing in January 2014 for processing the X-37B spaceplane while OPF-3 is also used by Boeing for the manufacture and testing of the CST-100 spacecraft. OPF-2 also currently remains under lease by Boeing for its X-37B spaceplane. The runway at KSC is currently used as a normal runway for the center and neighboring Cape Canaveral's daily operations. It may be used to land the X-37B and Sierra Nevada Dream Chaser spaceplanes. The SLF received its first landing since Atlantis in June 2017 when the USAF X-37B landed on it at the end of almost 2 years in orbit. In the 1980s, a planned successor to STS was called "Shuttle II", which encompassed a number of different ideas and was influenced by the Challenger disaster. At one point before retirement, extension of the Space Shuttle program for an additional five years while a replacement could be developed, was considered by the U.S. government. Some programs to provide access to space after the shuttle were the Lockheed Martin X-33, VentureStar, the Orbital Space Plane Program, and Ares I launcher (part of, and cancelled with Constellation). Some program from the 1980s were the NASA Advanced Manned Launch System program as well as the Future Space Transportation System program. There was a number of proposals for space access systems in the 1970s also, such as the Rockwell Star-raker  Star-raker was a large single-stage to orbit design that used both rockets and ramjet for propulision. It was a contemporary to the Boeing Reusable Aerodynamic Space Vehicle, which an all-rocket propulsion single-stage to orbit design. For comparison to an earlier retirement, when the Saturn IB was last flown in 1975 for the Apollo-Soyuz Test Project, the Shuttle development program was already well underway. However, the Shuttle did not fly until 1981, which left a six-year gap in U.S. manned spaceflight. Because of this and other reasons, in particular, higher than expected Solar activity that caused Skylab's orbit to decay faster than hoped, the U.S. space station Skylab burned up in the atmosphere. Following the Space Shuttle Columbia disaster, in early 2003 President George W. Bush, announced his Vision for Space Exploration which called for the completion of the American portion of the International Space Station by 2010 (due to delays this would not happen until 2011), the retirement of the Space Shuttle fleet following its completion, to return to the moon by 2020 and one day to Mars. A new vehicle would need to be developed, it eventually was named the Orion spacecraft, a six-person variant would have serviced the ISS and a four-person variant would have traveled to the Moon. The Ares I would have launched Orion, and the Ares V heavy-lift vehicle (HLV) would have launched all other hardware. The Altair lunar lander would have landed crew and cargo onto the moon. The Constellation program experienced many cost overruns and schedule delays, and was openly criticized by the subsequent U.S. President, Barack Obama. In February 2010, the Obama administration proposed eliminating public funds for the Constellation program and shifting greater responsibility of servicing the ISS to private companies. During a speech at the Kennedy Space Center on April 15, 2010, President Obama proposed the design selection of the new HLV that would replace the Ares-V but would not occur until 2015. The U.S. Congress drafted the NASA Authorization Act of 2010 and President Obama signed it into law on October 11 of that year. The authorization act officially cancelled the Constellation program. The combination of Ares I and Orion was predicted to cost about 50 billion dollars. One of the issues with Ares I was the criticism of the second stage, which the post-cancellation Liberty proposal attempted to address by using a second stage from an Ariane 5. The Liberty proposal applied for but was not chosen for commercial crew. The other ongoing complaint was that it made more sense to make a man-rated version of the Atlas or Delta. The first crewed flight for Ares I was scheduled for March 2015, and one of its priorities was crew safety. One reason for the emphasis on safety was that it was envisioned in the aftermath of the Columbia disaster. U.S. astronauts have continued to access the ISS aboard the Russian Soyuz spacecraft. The Soyuz was chosen as the ISS lifeboat during the development of the International Space Station. The first NASA astronaut to launch on a Soyuz rocket was Norman Thagard, as part of the Shuttle-Mir program. Launching on March 14, 1995 on Soyuz TM-21, he visited the Mir Space Station however he returned to Earth on the Space Shuttle mission STS-71. The start of regular use of the Soyuz began as part of the international space station program, with William Shepherd launching on Soyuz TM-31 in October 2000. NASA has continued to take regular flights in the following two decades. NASA is currently contracted to use Soyuz seats until at least 2018. The consideration of Soyuz as a lifeboat began in the aftermath of the dissolution of the Soviet Union. Russia proposed using the Soyuz as a life boat for what was still Space Station Freedom in late 1991, leading to further analysis of this concept in the early 1990s. One of the milestones was in 1992, when after three months of negotiations the heads of the two Space Agencies agreed to study applications of the Soyuz spacecraft. NASA also purchased several space modules from Russia including Spektr, Docking Module (Mir), Priroda, and Zarya. The NASA Authorization Act of 2010 required a new heavy–lift vehicle design to be chosen within 90 days of its passing. The authorization act called this new HLV the Space Launch System (SLS). The Orion spacecraft was left virtually unchanged from its previous design. The Space Launch System will launch both Orion and other necessary hardware. The SLS is to be upgraded over time with more powerful versions. The initial version of SLS will be capable of lifting 70 metric tonnes into LEO. It is then planned to be upgraded in various ways to lift 105 tonnes, and then, eventually, 130 tonnes. Exploration Flight Test 1 (EFT-1), an unmanned test flight of Orion's crew module, launched on December 5, 2014 on a Delta IV Heavy rocket. Exploration Mission-1 (EM-1) is the unmanned initial launch of SLS, planned for December 2019. The first manned flight of Orion and SLS, Exploration Mission-2 (EM-2) is to launch June 2022; it is a 10- to 14-day mission planned to place a crew of four into Lunar orbit. As of 2017, the destination for EM-3 is the Deep Space Gateway. The ISS is planned to be funded until at least 2020. There has been discussion to extend it to 2028 or beyond. Until another U.S. crew vehicle is ready, crews will access the ISS exclusively aboard the Russian Soyuz spacecraft. The Soyuz was chosen as the ISS lifeboat during the development of the International Space Station, and has been one of the space taxis used by the international participants to this program. A Soyuz took Expedition 1, which included one U.S. astronaut in the year 2000. Previously the United States and Russia had collaborated on extended the Mir space station with the Shuttle-Mir program in the 1990s. Although the Orion spacecraft is oriented towards deep-space missions such as NEO visitation, it can also be used retrieve crew or supplies from the ISS if that task is needed once the spacecraft is operational. However, it is expected that the Commercial Crew Program (CCP) will produce a functioning manned space vehicle as early as 2018, providing an alternative to Orion or Soyuz. The delay is longer than expected because the Ares I was cancelled in 2010, leaving little time before the STS retired for something new to be ready for flight. U.S. Congress was aware a spaceflight gap could occur and accelerated funding in 2008 and 2009 in preparation for the retirement of the Shuttle. At that time the first crewed flight of the planned Ares I launcher would not have occurred until 2015, and its first use at ISS until 2016. Another option that has been analyzed is to adapt Orion to a man-rated heavy launch vehicle like the Delta IV Heavy. (see also Evolved Expendable Launch Vehicle) Another spacecraft evaluated by NASA, and also for commercial crew, was the ATK Liberty rocket, which looked similar to Ares I and was based on Space Shuttle (SRB) and Ariane 5 (core stage) components. The Commercial Orbital Transportation Services (COTS) development program began in 2006 with the purpose of creating commercially operated automated cargo spacecraft to service the ISS. The program is a fixed–price milestone-based development program, meaning that each company that received a funded award had to have a list of milestones with a dollar value attached to them that they would not receive until after achieving the milestone. Private companies are also required to have some "skin in the game" which refers to raising additional private investment for their proposal. On December 23, 2008, NASA awarded Commercial Resupply Services contracts to SpaceX and Orbital Sciences Corporation (later, this company and Alliant Techsystems become Orbital ATK). SpaceX will use its Falcon 9 rocket and Dragon spacecraft. Orbital Sciences will use its Antares rocket and Cygnus spacecraft. The first Dragon resupply mission occurred in May 2012. The first Cygnus resupply mission occurred in September 2013. The CRS program provides for all the projected U.S. cargo-transportation needs to the ISS, with the exception of a few vehicle–specific payloads to be delivered on the European ATV and the Japanese HTV. The Commercial Crew Program (CCP) was initiated in 2010 with the purpose of creating commercially operated crew vehicles capable of delivering at least four astronauts to the ISS, staying docked for 180 days and then returning them to Earth. Like COTS, CCP is a fixed–price milestone-based developmental program that requires some private investment. ^ a b "Shuttle flights would continue under new proposal". Orlando Sentinel. March 3, 2010. Archived from the original on March 7, 2010. Retrieved March 4, 2010. ^ Coppinger, Rob (February 3, 2010). "NASA weighs plan to keep space shuttle until 2017". MSNBC. ^ NASA (April 12, 2011). "NASA Announces New Homes for Space Shuttle Orbiters After Retirement". Retrieved April 12, 2011. ^ McGeehan, Patrick (April 12, 2011). "Space Shuttle to Land in Manhattan". The New York Times. Retrieved April 12, 2011. ^ Matthew Travis (June 1, 2011). "Homes of Retired Space Shuttle Orbiters Announcement by NASA Admin Charlie Bolden". SpaceflightNews.net. Retrieved June 23, 2011. ^ Nolan, John. "No shuttle for Dayton; Air Force museum came close". Dayton Daily News. ^ "Why Houston Did Not Get A Shuttle". Wayne Hale's Blog. April 14, 2011. ^ "Lost in space: Shuttle snub offers a warning that our Space City standing may be at risk". Houston Chronicle. ^ "No space shuttle for Adler, but space-flight simulator on its way". Chicago Sun. ^ Broom, Jack (November 7, 2012). "Museum of Flight's Space Shuttle Trainer exhibit opens Saturday". Seattle Times. Retrieved September 25, 2014. ^ Broom, Jack (April 12, 2011). "Seattle won't get shuttle – but will get full-size simulator". Seattle Times. ^ a b "ESA hands over a piece of space history". ^ Bergin, Chris (October 21, 2010). "Replica engines recommended for retired orbiters – Flown SSMEs for HLV". ^ "SpaceX Falcon 9 - EchoStar 23 - NET Feb 28, 2017 - UPDATES". forum.nasaspaceflight.com. Retrieved February 8, 2017. ^ "Chris B - NSF on Twitter". Twitter. Retrieved February 8, 2017. ^ Forgione, Mary (January 22, 2014). "Florida: Kennedy Space Center's Vehicle Assembly Building tour to end". Los Angeles Times. Retrieved February 10, 2014. ^ Herridge, Linda (February 22, 2013). "Upgrades Will Prepare Crawlerway for Space Launch System". NASA. Retrieved February 10, 2014. ^ Boeing (January 6, 2014). "Boeing Expands at KSC To Support X-37B Program". SpaceRef Business. Retrieved February 10, 2014. ^ Chow, Denise (October 31, 2011). "Boeing to Build Private Space Taxis in Old NASA Shuttle Hangar". Space.com. Retrieved February 10, 2014. ^ Edelson, Edward. "Saving Skylab: The untold story" Popular Science, January 1979. ^ a b "Review of U.S. Human Spaceflight Plans Committee". NASA. October 22, 2009. Retrieved March 3, 2012. ^ Bush, George (January 14, 2004). "President Bush Announces New Vision for Space Exploration Program". Retrieved March 3, 2012. ^ Atkinson, Nancy (July 17, 2008). "Problems Surface For Constellation Program". Universe Today. Retrieved March 3, 2012. ^ "President Barack Obama on Space Exploration in the 21st Century". Office of the Press Secretary. April 15, 2010. Retrieved July 4, 2012. ^ a b "Today–President Signs NASA 2010 Authorization Act". Universetoday.com. Retrieved November 20, 2010. ^ a b Chow, Denise (November 17, 2011). "U.S. Human Spaceflight Program Still Strong, NASA Chief Says". Space.com. Retrieved July 2, 2012. ^ Zak, Anatoly (July 7, 2016). "First Soyuz MS enters orbit". Russian Space Web. Retrieved July 6, 2016. ^ Svitak, Amy (March 31, 2011). "Holdren: NASA Law Doesn't Square with Budgetary Reality". Space News. Retrieved July 4, 2012. ^ Clark, Stephen (March 23, 2011). "European states finally agree to space station extension". SpaceFlightNow. Retrieved June 30, 2012. ^ a b "Moving Forward: Commercial Crew Development Building the Next Era in Spaceflight" (PDF). Rendezvous. NASA. 2010. pp. 10–17. Retrieved February 14, 2011. Just as in the COTS projects, in the CCP projects we have fixed-price, pay-for-performance milestones," Thorn said. "There's no extra money invested by NASA if the projects cost more than projected. ^ "Space Exploration Technologies Corporation – Press". Spacex.com. Retrieved July 17, 2009. ^ "Worldwide launch schedule". spaceflightnow.com. Retrieved October 15, 2012. ^ a b Berger, Brian (February 1, 2011). "Biggest CCDev Award Goes to Sierra Nevada". Imaginova Corp. Retrieved December 13, 2011. ^ a b "NASA Announces Next Steps in Effort to Launch Americans from U.S. Soil". NASA. August 3, 2012. Retrieved August 3, 2012. ^ Leone, Dan (June 20, 2012). "NASA Banking on Commercial Crew To Grow ISS Population". Space News. Retrieved June 30, 2012. ^ "Congress wary of fully funding commercial crew". Spaceflightnow. April 24, 2012. Retrieved April 28, 2012.